On September 2, the Canadian Broadcasting Corporation (CBC) ran a news report on its flagship newcast, The National, on the controversy surrounding the question of whether or not the polar bear is endangered (as all of the other countries where the species is native claim), or whether the polar bear is doing just fine, thank you (as claimed by Canada). You can see it here. The question is important because, once more, the United States-a "range state" of the polar bear by virtue of the bears occurring in Alaska-is thinking of proposing that the species be afforded Appendix I protection under the Convention on International Trade in Endangered Species of Wild Fauna and Flora (CITES). Such a designation would not interfere with the tradition of northern Inuit being able to kill the bears for sustenance, self-protection, or any other purpose. But, it would eliminate their ability to make significant money from issuing hunting permits. Nunavut wants to continue to make money from big game hunters. Hunters won't be able to take their trophies home to Europe, the U.S., or Asia if the species is listed under Appendix I. Under CITES Appendix I, species, their parts, or derivatives cannot be internationally traded for "primarily commercial" purposes. While there is leeway for continued trade of Appendix I species for "educational" or "scientific" purposes, or because of various loopholes decided upon by countries signatory to the Convention, trophy hunting does not make the cut. The polar bear was identified by The National as a "pawn" in a "political" battle. But, what was not made clear is that only Canada has a materialistic dog in the race (specifically Nunavut, but Canada's federal government is internationally known for its general hostility toward environmentalists and pure research into global climate change). Follow the money. The four remaining range states-the U.S., Russia, Greenland, and Norway-do not materially benefit from prohibiting commercial trade, as they all do with only Canada allowing polar bear export (except in the broad sense that whatever future direct economic value might derive from the species is lost if polar bears go extinct). But, I would hope that we value such magnificent "charismatic megafauna" for more than what we can obtain from selling licenses to rich, mostly foreign, trophy hunters. The polar bear is a circumpolar species, and the lesson has been learned elsewhere. As usual, Canada is the international pariah, in denial. Or is it? 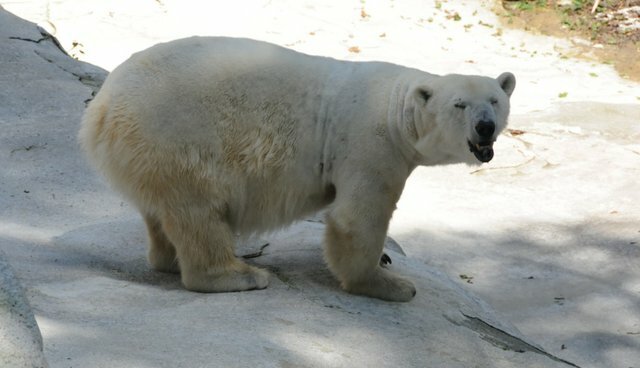 The show tried to make the case that there is at least equal evidence that concerns for the polar bear's existence are unfounded. Probably unknowingly, the CBC employed two tactics often used to justify culling common animals and hunting rare ones. First, ignore the situation elsewhere. (There are lots of bears in much of its Canadian range, so just ignore its uncontested plight anywhere else.) Second, prove an "increase" in bears by measuring the population against a historical low number. We will never know how many there once were, but we do know that the species lived as far South as Nova Scotia up until the 17th Century and was common along our East coast when Europeans first arrived. Perhaps my two biggest disappointments in the coverage were that it seemed like one obdurate scientist, Andrew Derocher, was stubbornly denying the evidence, while the item never explained why climate change (which everyone agreed was happening) can compromise the polar bear's survival. Just a year ago, another CBC radio show, The Current, defended a charge that it had gone the other way, implying that the polar bear was endangered when it was not. These kinds of challenges occur whenever a commercially valuable species warrants protection. When Nunavut-based scientist Dr. Mitchell Taylor, an outspoken critic of endangered status for the polar bear, said that protecting the polar bear would push the value of its pelts up, he was echoing the usual rhetoric from the far right-that free markets solve everything. Ironically, CITES has long extended every effort to allow commercial trade in elephant ivory, with devastating effect. The more accommodating to market forces, the more illegal poaching. Increasingly, conservationists call for a complete shutdown of all commerce in elephant ivory. Conservation works better when there is no commercial value to the species (think whooping crane or California condor) and works best when applied before the species is unquestionably depleted throughout its range. Measuring populations that have recovered a short distance from an all-time low-or by assuming that, because the bears show up in increasing numbers near human habitations looking for food, they must therefore be increasing-reminds me of the fight to reduce tobacco consumption, or even to get recognition for human-caused climate change. And, no wonder; Taylor is an adviser to the Heartland Institute, a Chicago-based libertarian "think tank" that worked with a tobacco company to question the health threats of second hand smoke and to champion free-market environmentalism. The Heartland Institute was called "the world's most prominent think tank promoting skepticism about man-made climate change" by The Economist in 2012-and seems proud of it, having the quote on its website. I wish that the CBC had mentioned that. You can always find an expert to take the contrary side, but the overwhelming consensus is that, yes... polar bears are endangered. Taylor has no technical expertise in the field of climate change, and to understand the plight of the polar bear, you need to not only understand its commercial value to Nunavut, but the bear's dependence on viable populations of ringed seals (now a high priority candidate for assessment by the Committee on Species of Endangered Wildlife in Canada (COSEWIC). The issue is certainly far more complex than The National indicated, but the vast majority of experts agree that the time to save the polar bear is now-and stopping its commercial exploitation is part of what must be done.